Skotnes is a pivotal figure in twentieth-century South African art. As a member of the younger generation of artists emerging in the 1950s after the Second World War, he assisted notably in generating an art which embraced a South African identity, was more in line with international trends and which renounced the moribund and derivative conventions of the first half of the century. However, it was his role as a cultural officer of the Non-European Affairs Department at the Polly Street Art Centre in Johannesburg from 1952 until 1966 that earned him an honourable position in the history of the emergence of black urban art in South Africa. His influence is identifiable in the work of many who studied and worked at Polly Street, then virtually one of the only places for black artists to receive training. For this reason Skotnes, even as a white artist, was included in groundbreaking revisionist exhibitions on the marginalised history of black artists in the apartheid era, such as The Neglected Tradition, held at the Johannesburg Art Gallery in 1988. Enthralled by the example of Pablo Picasso (1881–1973) and Henry Moore (1898–1986) on a visit to Europe in 1951, these particular artists confirmed Skotnes’ initial attraction to painting and drawing. However it was as a printmaker that he subsequently made his greatest impact as an artist. His entire art has to a large extent revolved around the planar and shallow-relief aspects of the woodcut. He extended the potential of this medium initially by his use of large scale in his prints, and then, in the early 1960s, explored the possibilities presented by the wood blocks themselves as independent art works, engraving, colouring and texturing them. This medium was embraced with much energy despite its intractability, leading to new departures in his art. The 1960s were a highly successful phase of his career in which he produced many panels to great public acclaim. As Esmé Berman has noted, however, these engraved panels led to ‘many repetitious statements’, of which Skotnes himself was acutely aware. The demanding techniques of the panels were therefore put aside from time to time during the mid to later 1960s to explore the more spontaneous art of drawing in coloured chalks and charcoal as a way of injecting fresh ideas into his art. One of a range of drawings from this period in the Campbell Smith Collection, Untitled (1966) (plate 123) shows the artist working with the quasi-African and totemic forms that are the staple of his art. It also shows his awareness of the format which dictates his compositional possibilities. The large area of blank paper which enframes the image is evidence of the depth of Skotnes’ abiding graphic concerns, even when working in a medium that is not ostensibly pure printmaking. Born East London, Eastern Cape, 1926; died 2009. 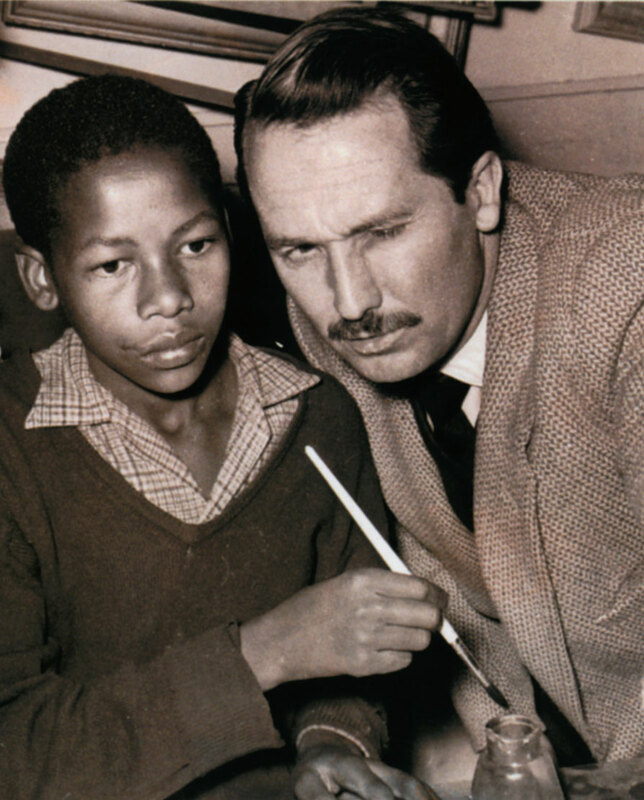 Training 1946: Studied under Heinrich Steiner in Florence and also at the Witwatersrand Technical College. 1947-1950: University of the Witwatersrand under Professor Heather Martienssen, Douglas Portway and Charles Argent. Selected Exhibitions 1956: First solo exhibition, Johannesburg. 1968: Seven Present-day South African Artists, Gulbenkian Foundation, Lisbon. 1971: Republic Festival Exhibition, Cape Town. 1972: Retrospective exhibition, Pretoria Art Museum. 1988: The Neglected Tradition, Johannesburg Art Gallery. 1999: Retrospective exhibition, Iziko SA National Gallery, Cape Town (touring). 2001: The Short Century: Independence and Liberation Movements in Africa, 1945–1994, Munich, Berlin, Chicago and New York. 2004–2005: Joint exhibition with Edouardo Villa at Lanzerac, Stellenbosch. Collections Iziko SA National Gallery, Cape Town; Johannesburg Art Gallery; Pretoria Art Museum; Nelson Mandela Metropolitan Art Museum, Port Elizabeth; William Humphreys Art Gallery, Kimberley; Durban Art Gallery; Royal Museum of Fine Art, Copenhagen, Denmark. Awards 1976: Medal of Honour awarded by the SA Akademie vir Wetenskap en Kuns. 1978: Gold, silver and bronze medals awarded at the Grahamstown Festival of the Arts for his services to South African art. 1996: Honorary doctorates from Rhodes University and the University of the Witwatersrand. Cecil Skotnes helping a young student at the Polly Street Art Centre. Source: Pippa Skotnes. 2001. “ … Bearded Seals and Fifteen Geese.” Cecil Skotnes: A South African Artist in Norway. Royal Norwegian Embassy in South Africa. p. 11.